Willem de Kooning: "Maybe... I was painting the woman in me. Art isn't a wholly masculine occupation, you know. I'm aware that some critics would take this to be an admission of latent homosexuality... If I painted beautiful women, would that make me a non-homosexual?" 1950: Barnett Newman makes his first sculpture. January 23, 1950: Barnett Newman's first solo exhibition opens at the Betty Parsons Gallery. Tony Smith and Mark Rothko helped with the installation. Press response was generally negative and one of the paintings was vandalized. Thomas Hess wrote in Art News that "Newman is out to shock, but he is not out to shock the bourgeoisie - that has been done. He likes to shock other artists." February 17, 1950: André Malraux's Voices of Silence symposium at the Club. February-19 March 1950: "Seventeen Modern American Painters: The School of New York" exhibition at the Yale University Art Gallery in New Haven, Connecticut. The exhibition would travel to the Frank Perls Gallery in Beverly Hills, California from January 11 - February 7, 1951. It included Jackson Pollock's Number 3, 1949: Tiger (1949). Robert Motherwell wrote the preface for the catalogue. He titled the preface "The School of New York." 1950: Mark Rothko exhibition at the Betty Parsons Gallery. 1950: Elaine de Kooning meets Mark Rothko and Jeanne Reynal. Elaine first met Rothko at parties. Rothko and Elaine became friends as a result of a letter she sent him after seeing an exhibition by him. When asked to compare Rothko's persona with that of Arshile Gorky, Elaine thought Rothko had a "very healthy self-worship:"
1950: Clyfford Still returns to New York. c. February 1950 - January 1951: Emmanuel Navaretta lives with Franz Kline for approximately eleven months. February 28 - March 20, 1950: "Black or White: Paintings by European and American Artists" at the Samuel M. Kootz Gallery. March 2, 1950: "Modern Style" at the Club with speaker Heinrich Blücher. March, 1950: Jackson Pollock's therapist dies. Dr. Edwin Heller died in a car accident ending his successful treatment of Pollock's alcoholism. (PP324) In November Jackson started drinking again, ending the longest period of sobriety he would have as an adult. March 25, 1950: "Spatial Form in Modern Literature" at the Club with speaker Joseph Frank. Adolph Gottlieb wrote the introduction to the exhibit. Rothko's mother had died about a year and a half before his European trip - in October 1948. In March 1949 Rothko had shown his multiforms at Parsons' gallery. The evening was a homage to Marini whose statue of a horse and rider had recently beeen purchased by the Museum of Modern Art. An informal evening and party. April 13, 1950: A talk on Paris at the Club with speaker K. Costello. April 15, 1950: Mark Rothko's Number 8, 1949 appears in Vogue magazine. April 1950: A symposium on the new art is held at Studio 35. April 27: "The Oppositions of Sensibilities and Subject Matter" at the Club with speaker Thomas B. Hess. Late April - May 1950: "Talent 1950" exhibition at the Kootz Gallery. The exhibition featured one work each by twenty-three artists chosen by Clement Greenberg and Meyer Schapiro. It included work by Robert Goodnough, Larry Rivers, Esteban Vincente, Friedebald Dzubas (aka Friedel Dzubas), Harry Jackson, Alfred Russell, Elaine de Kooning and Franz Kline. Rothko wrote to Lippold from Cagnes-sur-Mer inquiring about "an opening in your school" in Trenton, New Jersey. In his letter he wrote that "certain developments in our circumstances" (probably a reference to Mell's pregnancy) had made it necessary for him to look for a teaching job, noting that "I have long thought it the best solution for the artist." (RO287) Rothko did not get a position at Lippold's school, but would be offered an assistant professorship at Brooklyn College in December (see December 1950 and February 1951). May 18, 1950: "Culture and Belief" with speaker Father Lynch, introduced by Robert Motherwell. May 22, 1950: Artists protest the Metropolitan Museum of Art in the The New York Times. The article was headlined "18 Painters Boycott Metropolitan; Charge 'Hostility to Advanced Art.'" The letter continued: "We draw to the attention of those gentlemen the historical fact that, for roughly 100 years, only advanced art has made any consequential contribution to civilization." The artists who signed the letter were: Jimmy Ernst, Adolph Gottlieb, Robert Motherwell, William Baziotes, Hans Hofmann, Barnett Newman, Clyfford Still, Richard Pousette-Dart, Theodoros Stamos, Ad Reinhardt, Jackson Pollock, Mark Rothko, Bradley Walker Tomlin, Willem de Kooning, Hedda Sterne, James Brooks, Weldon Kees and Fritz Bultman. Sculptors who signed the letter were Herbert Ferber, David Smith, Ibram Lassaw, Mary Callery, Day Schnabel, Seymour Lipton, Peter Grippe, Theodore Roszak, David Hare and Louise Bourgeois. Barnett Newman told the journalist for The New York Times that although they were critical of the membership of the five regional juries they were specifically opposed to the New York group, the "national jury of selection" and the "jury of awards." The New York group of jurors were Charles Burchfield, Yasuo Kuniyoshi, Leon Kroll, Ogden Pleissner, Vaclav Vytlacil and Paul Sample. The national jury consisted of Mr. Hale, Mr. Pleissner, Maurice Sterne, Millard Sheets, Howard Cook, Lamar Dodd, Francis Chapin, Zoltan Sepeshy and Esther Williams. The jury of awards included William M. Milliken, Franklin C. Watkins and Eugene Speicher. First prize was $3,500, second $2,500, third $1,500 and fourth $1,000. May 23, 1950: The New York Herald Tribune attacks "The Irascible Eighteen" for "distortion of fact." Spring 1950: Willem de Kooning paints Excavation. According to de Kooning biographers Mark Stevens and Annalyn Swan, de Kooning began painting Excavation in "early spring of 1950" (DK293) and completed it "in May 1950." (DK305). Summer 1950: Mark Rothko refuses to provide a self-statement for The Tiger's Eye and the Magazine of Art. June 8, 1950: "Painter as Editor" at the Club with speaker John Stephan (co-editor of Tiger's Eye with his wife Ruth). June 1950: Willem de Kooning begins Woman I . Woman I was not the first "Woman" that de Kooning painted - there had also been a Woman in c. 1944, a Woman in 1948, and various other "Woman" paintings during his lifetime. According to de Kooning biographers Mark Stevens and Annalyn Swan, "In June 1950, not long after sending Excavation to Venice, de Kooning placed two seven-foot-high sheets of paper on the painting wall of his Fourth Avenue studio and began the drawings that would lead to one of the most disturbing and storied paintings in American art, Woman I." (DK309) The work would not be completed by de Kooning until 1952. June 1950: Jackson Pollock is photographed painting for Art News - sort of. The rest of the article was less positive. Time magazine used the negative comments from the article in a news item on November 20, 1950 (see below). When Barr explained his choices in the June 1950 issue of Art News, he noted that "several names have ben used to describe this predominant vanguard: 'symbolic abstraction,' 'abstract expressionism,' 'subjectivism,' 'abstract surrealism.'" June 22, 1950: "Existentialism" with speaker Professor William Barrett of NYU. Summer 1950: Jackson Pollock, Tony Smith and Alfonso Ossorio discuss a Catholic Church. Pollock was at the opening of the exhibition "Ten East Hampton Abstractionists" at the the Guild Hall in East Hampton. Included in the show were works by Pollock, Lee Krasner, James Brooks, John Little, Wilfred Zogbaum, Buffie Johnson and other artists who had moved to the area. Namuth, a photographer from Harper's Bazaar, introduced himself and told him that he was renting a house for the summer in Water Mill. Namuth told Jackson he admired his work and would like to photograph him although not necessarily for Harper's Bazaar. Jackson agreed to do it. When Namuth rang the following week to make an appointment, Jackson promised Namuth that he could photograph him starting and possibly finishing a painting, just as he had promised Art News earlier in the year. When Namuth arrived Pollock told him that the painting was actually finished and that he did not plan to do any more work that day. Namuth asked if he could see Pollock's studio and Pollock and Krasner took him into the studio. A still-wet large painting was lying on the floor. 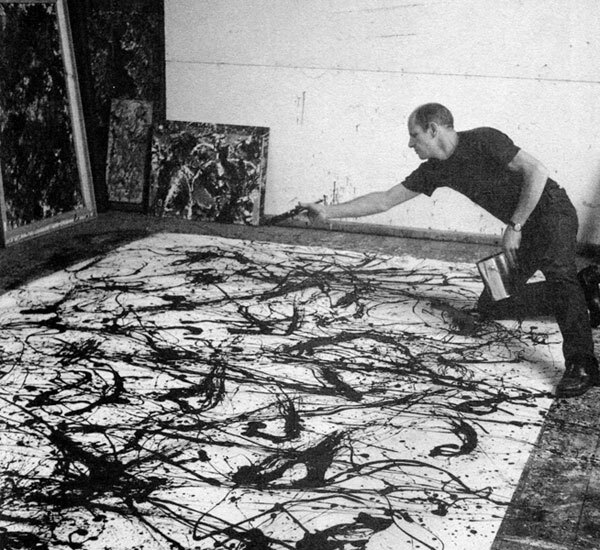 Namuth viewed the canvas through his viewfinder and suddenly Pollock picked up a brush and started to paint. Namuth started shooting - the session lasted about half an hour with Namuth photographing Pollock as he was painting. When Namuth brought the developed photos to Pollock the next weekend, Pollock asked if he had more. He didn't. So, throughout the summer Namuth returned to the Springs on the weekends to take more photographs. (JP208-9) He ended up taking 200 photographs of Pollock working on One: Number 31, 1950 and Autumn Rhythm: Number 30, 1950. (PP324/PP329fn36) The photographs would be published in 1951. July 1950: The Pollocks have a family reunion in the Springs. The Pollocks. The Springs 1950. In front of Number 2, 1949. July 22 - August 12/15, 1950: Jackson Pollock exhibition in Venice. August 1950: Franz Kline gets a job as an art instructor at a summer resort. August 1950: Barnett Newman moves to a new studio. We improved a shining weekend on eastern Long Island by paying a call on Jackson Pollock - an uncommonly abstract abstractionist and one of seven American painters whose work was tapped for inclusion in the Twenty-fifth International Biennial Exhibition of Figurative Arts, now triumphantly under way in Venice... Pollock, a bald, rugged, somewhat puzzled-looking man of thirty-eight, received us in the kitchen, where he was breakfasting on a cigarette and a cup of coffee and drowsily watching his wife, the former Lee Krasner... as she bent over a hot stove, making currant jelly. Waving us to a chair in the shade of a huge potted palm, he remarked with satisfaction that he had been up and about for almost half an hour. It was then around 11:30 A.M. "I've got the old Eighth Street habit of sleeping all day and working all night pretty well licked," he said. "So has Lee. We had to, or lose respect of the neighbors. I can't deny, though, that it's taken a little while. When'd we come out here, Lee?" Mrs. Pollock laughed merrily. "Just a little while ago," she replied. "In the fall of 1945." "It's marvelous the way Lee's adjusted herself," Pollock said. "She's a native New Yorker, but she's turned into a hell of a good gardener, and she's always up by nine. Ten at the latest. I'm way behind her in orientation. And the funny thing is I grew up in the country. Real country - Wyoming, Arizona, northern and southern California. I was born in Wyoming. My father had a farm near Cody. By the time I was fourteen, I was milking a dozen cows twice a day." "Jackson's work is full of the West," Mrs. Pollock said. "That's what gives it that feeling of spaciousness. It's what makes it so American." Autumn 1950: "Young Painters in the U.S. and France" at the Sidney Janis Gallery. The exhibition, which Janis worked on with Leo Castelli, paired American artists with French ones. De Kooning's Woman (1949-50) was paired with Jean Dubuffet's L'Homme au chapeau bleu (1950). Jackson Pollock was paired with Lanskoy, Mark Rothko with de Staël and Kline with Soulages. Autumn 1950: Willem de Kooning teaches at Yale. 1950: Robert Motherwell joins the graduate faculty at Hunter College. 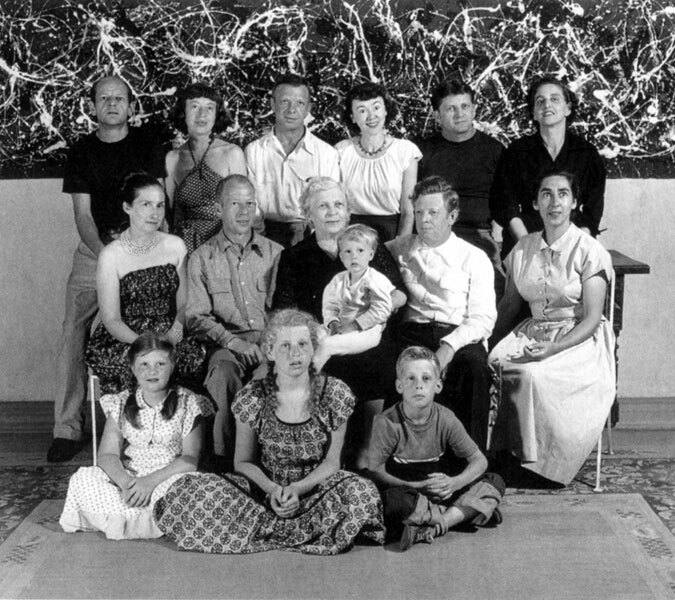 September 2 - 3, 1950: Hans Namuth begins filming Jackson Pollock painting. At the end of the summer when Namuth was visiting Pollock's studio on the weekends to photograph him, Namuth came up with a new idea - to film Pollock with a movie camera while he painted. Pollock agreed to the idea and Namuth arrived during the first weekend in September with his wife's Bell and Howell Turret. Namuth showed the seven minutes of footage he shot to a film editor friend, Paul Falkenberg, who suggested that Namuth make a color film and offered to help him get the two thousand dollars to fund it. The color film required lighting and since the barn that Pollock used as a studio did not have any electricity, Pollock offered to work outside. Although he had finished the paintings he was doing for his upcoming show at the Betty Parsons Gallery, Jackson offered to paint one more painting which they could film. On November 25, 1950 - the Saturday after Thanksgiving, Namuth finished filming Pollock. October 16, 1950: Exhibition of mosaics by Jeanne Reynal opens at the Hugo Gallery. October 16 - November 4, 1950: Franz Kline's first one-man show in New York. October 16, 1950: Party for Franz Kline after his opening at the Charles Egan Gallery. November 10 - December 31, 1950: Whitney Annual. November 14 - December 4, 1950: "Motherwell: First Exhibition of Paintings in Three Years" at the Samuel M. Kootz Gallery. November 20, 1950: Jackson Pollock appears in Time magazine. The news item was titled "Chaos, Damn It!" and noted that "The Museum of Modern Art's earnest Alfred Barr, who picked Pollock, among others, to represent the U.S. in Venice's big Biennale exhibition last summer, described his art simply as "an energetic adventure for the eyes." It also quoted negative comments made by Critic Bruno Alfieri in L'Art Moderna about Pollock's paintings shown earlier in Venice (see above). Complete lack of structural organization. Total absence of technique, however rudimentary. But these are superficial impressions, first impressions . . . Each one of his pictures is part of himself. But what kind of man is he? What is his inner world worth? Is it worth knowing, or is it totally undistinguished? Damn it, if I must judge a painting by the artist it is no longer the painting that I am interested in . . .
For Jackson, the "most exciting part" of the piece was the bit that compared Pollock to Picasso. November 24, 1950: "American versus French Art" at the Club. The photo and article on the "Irascibles" was published in the January 15, 1951 issue of Life. December 1, 1950: "Art and Honesty" at the Club with speaker David Hare. December 22, 1950: "Detachment and Involvement" at the Club with speaker Ad Reinhardt. December 28, 1950: Mark Rothko receives a financial statement from Betty Parsons.